The FBI says it's expanded its search nationwide for a 13-year-old Wisconsin girl missing since her parents were found shot to death in their home Monday morning. Authorities say Jayme Closs was in the house when her parents – 46-year-old Denise and 56-year-old James Closs – were killed. When officers responded minutes after a 911 call to the home in Barron, about 80 miles northeast of Minneapolis, they found no suspicious vehicles, says CBS Minnesota. The FBI said Thursday that, "out of an abundance of caution," it was sending a digital Missing Person poster to local media partners across the country for display. More than 100 local and state FBI agents have been working on the case, and officials say hundreds of tips have come in from the community and people around the country, the station reports. 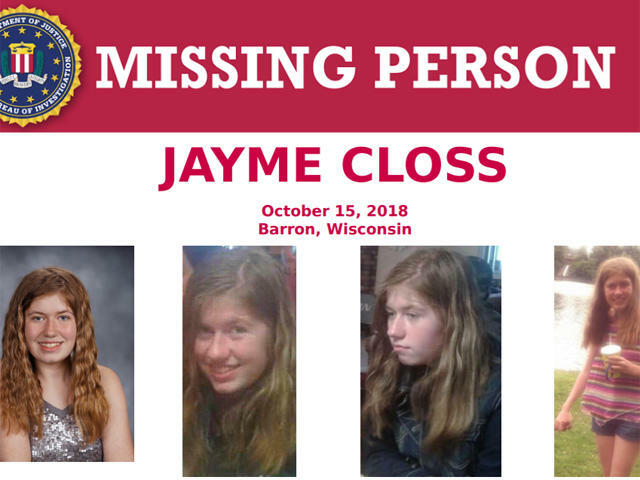 One-hundred volunteers have joined the search for Jayme, authorities said Thursday, after Barron County Sheriff Chris Fitzgerald asked for people to pitch in. He said Wednesday investigators believe she's alive but in danger and he urged the public to continue calling in tips. The sheriff's office posted on Facebook Thursday afternoon that so far "nothing of evidentiary value has been recovered." She's described as standing 5-feet tall, weighing 100 pounds, with green eyes and blonde hair.